Let’s face it, yummy math is the only math I like. Remember how I told you that something about the fall makes me crave ALL the pecans? And then I proceeded to share ALL the recipes bursting full of pecans? 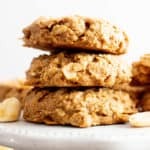 SEE: paleo apple crisp, maple pecan pumpkin muffins, chocolate pecan fudge (my fave, if I had to pick one), super fudgy paleo maple pecan brownies (and boy do I mean fudgy!! 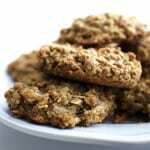 ), oil-free cinnamon granola… and more. Yes, MORE!! Well, it turns out y’all love the pecans as much as I do! High-five for shared likes! High-five for edible commonalities. Oooh… edible commonalities. Doesn’t that totally sound like a fancy restaurant or something? All sarcasm aside (like anyone has time for sarcasm in the fall), some folks didn’t always prefer the whole “watch very carefully while stirring frequently, and try not to burn” thing. Imagine that. Dang it, what did I say about sarcasm? 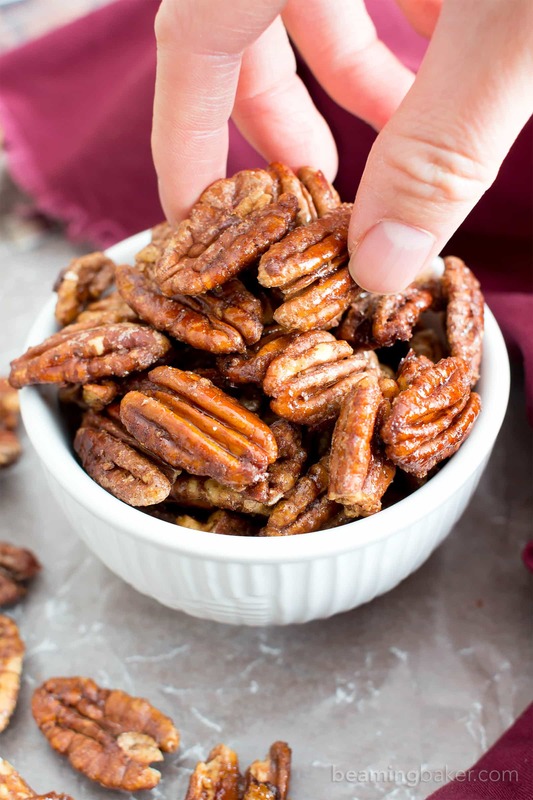 So here I present to you the easiest of the EASIEST, 4 Ingredient Oven-Roasted Paleo Candied Pecans recipe. Seriously. But trust me, this recipe comes together so quick, you’ll be mildly suspicious of how fast it came together. Dare I even say it, you’ll be a touch doubtful that it’ll work. Gasp! 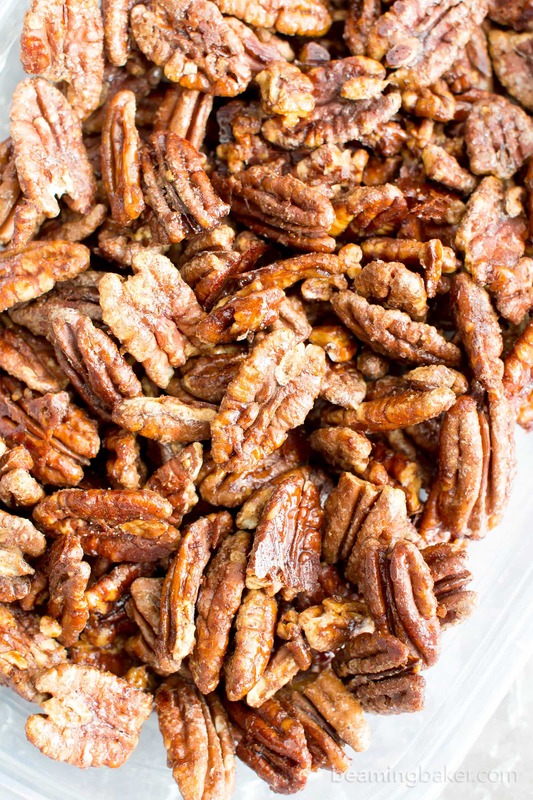 All you have to do is throw together pecans, cinnamon and salt in a bowl. Stir with vigor (if you’re so inclined), as this is like the only “tough” thing you’ll have to do. I kid. About it being tough! 😉 Then, pour that maple syrup over the pecans like it’s your job and you love it. Yeah!! Stir and fold until the pecans are well coated. Then, dump those pecans ever so gracefully on the prepared baking pan. Bake for 15 minutes, stir and flip, then bake for a few more minutes. Cool, then boom! All done! 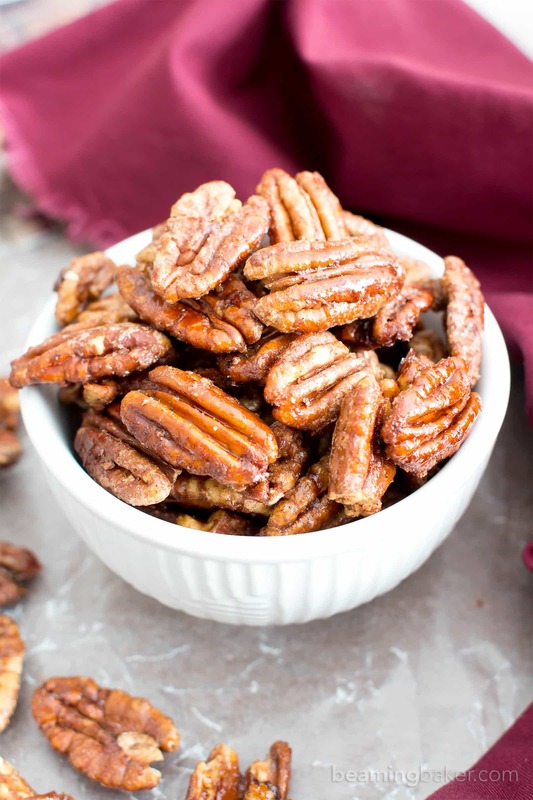 And seriously, the whole stirring/prep time is so minimal even I get suspicious when I make these 4 Ingredient Oven-Roasted Paleo Candied Pecans. Like, how is that that easy?? Really?? 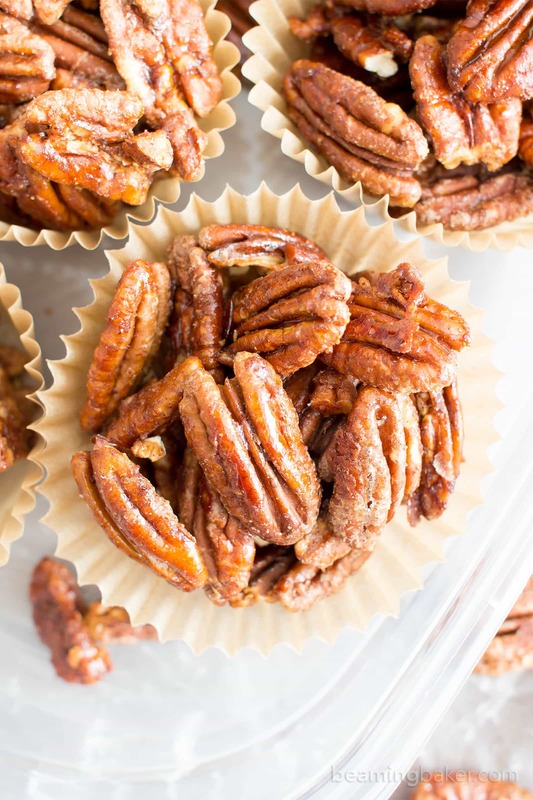 And when these candied pecans start baking… oh boy. And you know I never say “oh, boy!” It’s like the sweetest, warmest, coziest maple pecan candy delights factory in your house. You instantly feel all the good fall vibes and you instantly know that it’s time to just chill. But in a warm, cozy way. That’s not chill at all. Just relaxed. 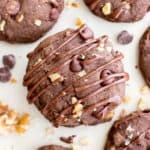 These candied pecans have even been tested on my very own family—who pride themselves on being the top, foremost experts in candied nut tasting in the world. Due solely on the amount they consume per year. And not any other form of professional accreditation. 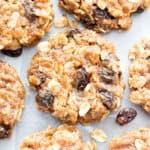 My sister Jenny (an actual connoisseur of junk food/candy/usually begs me not to tell her about how healthy the treats I brought are because she won’t like them anymore) said that these 4 Ingredient Oven-Roasted Paleo Candied Pecans taste perfectly sweet, just like candied pecans we’d buy from candy shops growing up. She was super surprised to learn how little sugar I had included in this recipe. She even held one up to the light and remarked how shiny and glazed they are, like they do in the movies! (Okay, maybe I’m talking about a scene in Willy Wonka, maybe I’m talking about that scene in Jurassic Park when John Hammond holds his amber-topped walking stick and describes the magic of bringing back dinosaurs. Potato, Potah-toe). 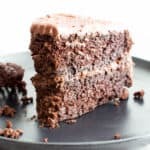 As for Erik and I, we love to just make up a batch and keep it on hand for when those sweet cravings hit and we simply cannot eat more maple pecan brownies. Okaaaaay, we finished them. And there were no more left. What’s your favorite nut or seed to candy? 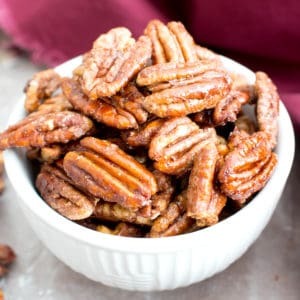 4 Ingredient Oven-Roasted Paleo Candied Pecans (V, GF): learn how to make deliciously glazed candied pecans with this easy, lower sugar recipe. 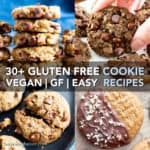 Paleo, Vegan, Gluten-Free, Dairy-Free. Add pecans, cinnamon and salt (if using) to a large bowl. Stir until well mixed. Add maple syrup and coconut sugar. Stir and fold until pecans are fully coated. 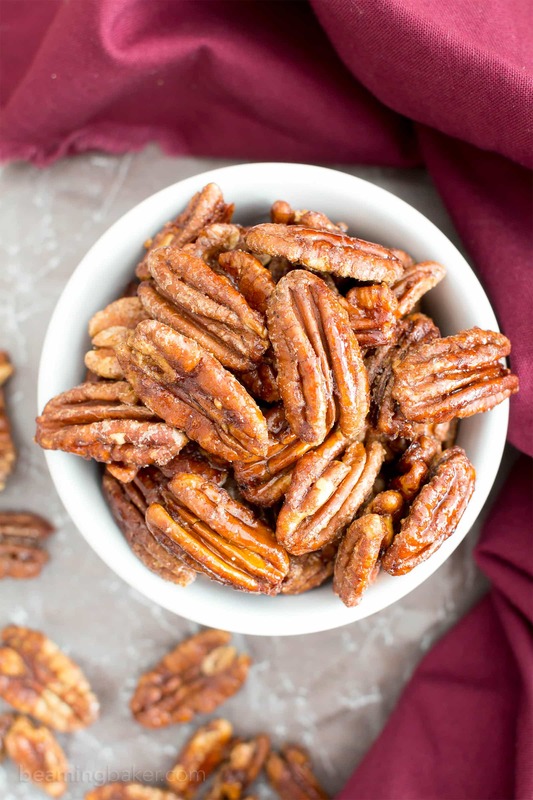 Pour pecans onto the prepared baking sheet. Spread into an even layer, with empty pockets at regular intervals to let air through. Bake for 15 minutes. Using a heatproof spatula, flip pecans to evenly crisp the other side. 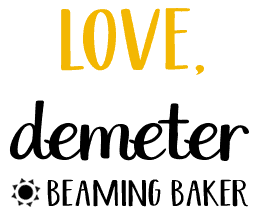 Bake for an additional 6-12 minutes. Mine took a total of 24 minutes. 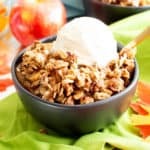 - Adapted from my Skillet-Roasted Cinnamon Pecans and my Oil-Free Cinnamon Nut Paleo Granola. - Storage notes: Cool completely before storing. Store in an airtight container for 1-2 months at room temperature, in a cool, dark environment. 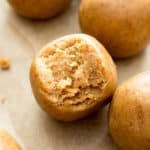 - More cozy Fall & Winter Recipes: maple pecan pumpkin muffins, paleo maple pecan brownies, chocolate pecan fudge. this is the perfect DIY gift! 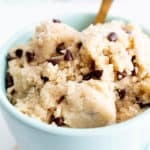 Love the healthier version too! That’s what I was hoping you’d say! 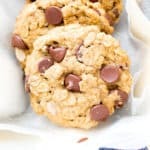 🙂 Healthier treats are the best! These are SO perfect for fall gifting, parties, or snacks 😀 Can’t wait to make a batch! Good afternoon, Diana!! 🙂 Woohoo!! I’m so pleased that you enjoyed reading my post. Sometimes I’m like, “is anyone out there? !” Lol. Jk! I hope you and your dad loved this! Have a wonderful day & happy holidays!